Height/Weight: Using our incredibly accurate “baby stretched out on two newspapers” method, we’re clocking BIT in at 27.5 inches. Which is insane. And getting on and off the scale, she measures in at 17.6 lbs. Her next official check isn’t until New Year’s Eve, so we won’t have the percentiles, etc until then, but I know she’s a behemoth. Diapers/Clothes: Speaking of being a behemoth, both DB and I think that the size 3 diapers are getting to be too small and it’s time to transition up to size 4. 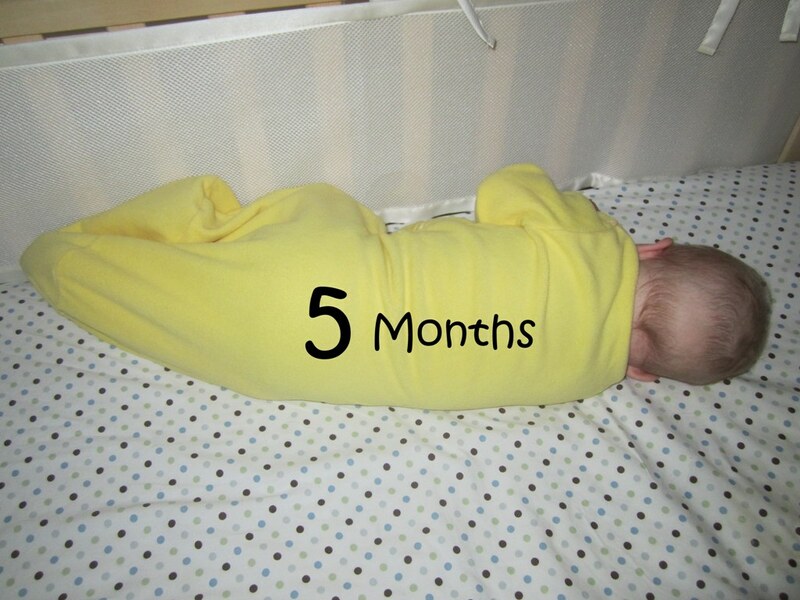 AND I packed up every single article of 3-6 month clothing we had and have switched to pure 6-9 month. I even put BIT into a 9-12 month jumper the other day – and it fit. A lot of times, it’s not that it’s super tight around the middle; it’s that she’s soooo long. Eating: We bumped BIT up to 6 ounce bottles, which is stretching her out to 3-4 hours sometimes during the day. (Sometimes, she still wants to eat every 2-2 1/2 hours but she’s wily like that and tries to keep us on our toes.) When it comes to solids, we’re not pushing the envelope like I feel we did with LB. We’ve given BIT some tastes of apples, peaches, and sweet potatoes, but that’s it. Not every day and not big amounts, especially as the vast majority of it still comes back out with the tongue thrust reflex. I bought a box of banana whole wheat cereal that I figure I’ll bust out some time soon, but I’m really not in the rush I was with LB. Probably because I know now how much easier it is when all of your child’s nutrition is in a bottle, extremely portable and easily delivered. But I figure we’ll be making more an effort at practicing solids this next month. Sleeping: Okay, so this may sound absolutely insane and untrue, but I promise I’m not exaggerating in the slightest: BIT sleep-trained herself last month. And it was painful for everyone involved. Well, she didn’t want to eat. She didn’t want her paci. She didn’t want anything but to maybe be rocked while I was holding her and walking and shushing, which God knows wasn’t going to happen. So I put her back in her crib and went and laid back down. And she proceeded to cry for nearly 2 hours. After 2 hours, she fell asleep and slept through until 6 am. The next night, the exact same thing happened but she only cried for 45 minutes. The following night, she slept through until 5:30 without a peep. And since then, she’s consistently slept until between 5:30 and 6:30 without a problem. Naps are a bit of a different bird, as we’re on the go so much we haven’t spent a lot of time working on a consistent nap schedule for her. I know she would be happiest with 3 solid naps a day but it’s hard to make that work with LB. I’m trying, truly I am, and most days we’re home together she does get 3 naps, though the length of nap is a bit of a crapshoot. And daycare is still a total crapshoot, with 3 naps some days and 1 or 2 naps other days. The days where she gets fewer than 3 naps, she’ll take a blip nap at home and then go to bed a little early. Additionally, BIT is learning to out her own paci back in during the middle of the night. As long as its near her, she can do it. But finding it and putting it in as still a bit much. She’s also reaching for and grabbing things, pulling on toys to make them play music, rocking the Jenny Jump-Up, and generally nomming on anything she can get near her mouth. It makes for some slobbery times in our household.